Do People Talk About You? If you are marketing some product over the World Wide Web, or doing some other activities – for example blogging – that can be subject to internet users judgment, its important to know if people are talking about you, if yes if they are talking positively or negatively, and even in which conversations you are involved. These are important information that you need to know to best accomplish your cyber activities. In this topic I provide some tools that will help you figure out these information. 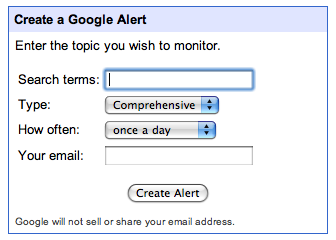 Google alerts is a free services offered by the internet giant, which notifies you by email or as an RSS feed about a specific query or topic you provide. For example you can monitor who is talking or mentioning your name all over the web. Using this services Google will send you periodic emails (daily, weekly or by occurrence) pointing you to the sites that are talking about you, there are six types of searches (News, Web, Blogs, Comprehensive, Videos and Groups). Note that you can use Google operators for the search terms, for example to know if someone has provided a link to your website (www.you.com) you could use this search term (link:http://www.you.com). Twitter is a social website. This is a perfect place to listen to what people are saying about your company or product, you can even subscribe to an RSS feed of the search results. 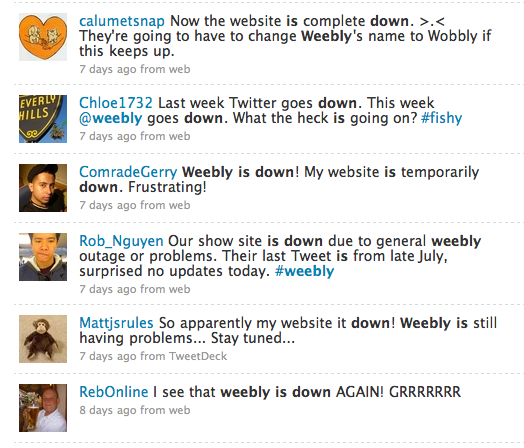 For example in 12/08/2009 my blog host (Weebly) was down and I couldn’t publish my new updates, trying to figure out what is happening I searched the Weebly keyword and got those results shown below, where everybody was complaining that the service was down. If you have a major product, and want to know what people are thinking about it, you could simply type your brand name in twitter and get real time information, or you could type your competitor product names and see if he is getting more positive feedback than you. Technorati is a blog search engine that lets you find out what people are saying about you within the blogosphere, The results can be available in RSS format, so you can subscribe to the various search results as well. These where free services, there are other commercial tools that allow you to monitor yourself on the web, and show some analytical data the most popular are Radian6 and Trackur. You are currently browsing the Uncategorized category at Omar Al Kababji.